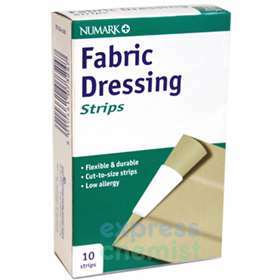 Numark fabric dressing strips offer durable protection of wounds and are flexible for ease of movement and comfort. The breathable fabric material enables air to penetrate the wound, aiding the healing process. Contains 10 strips measuring 10cm x 6cm. Directions for Use: Cut dressing strip to required length. Clean and rinse the wound and surrounding skin. Dry the skin thoroughly for effective adhesion. Apply plaster gently but firmly. Replace dressing as required at least every day. Precautions: Use each cut strip only once. If the wound does not appear to heal, or continues to bleed seek medical advice. Store in a cool dry place. Do not use after expiry date.